Crowe is boxer Jim Braddock, married with three kids (to René Zellweger). He’s life is turned upside down when the stock market crashes and his poor investments leave him penniless. With his pugilistic license revoked it is only his loyal manager (Paul Giamatti) who never gives up hope. The outcome is still full of thrills and is a Ron Howard specialilty. He consistently turns mostly-factual events into spellbinding viewing, even when a Google search tells you the reality of the drama unfolding. 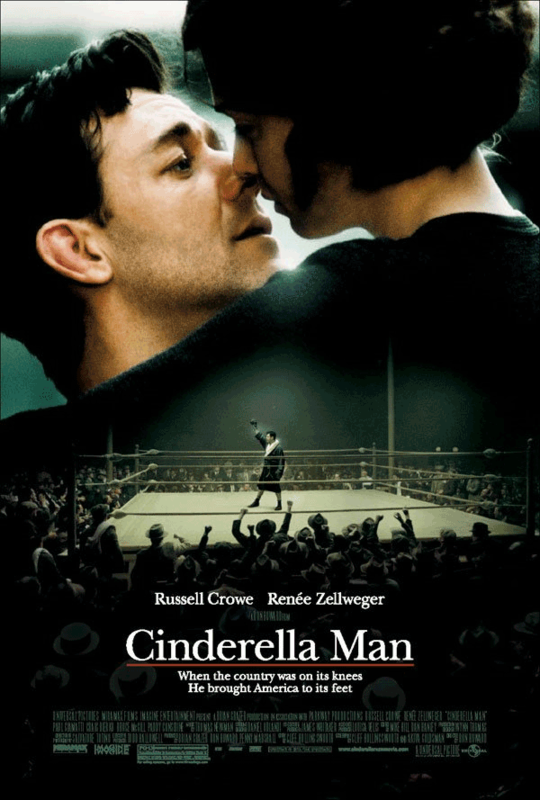 Crowe is pure quality and I could not think of anyone more perfect in the role of Braddock; fighting through broken bones and slum living, trying to regain his position in boxing, for the simple reason that his family must not starve; as at its centre this is a simple story, a celebration of the underdog, and a David over Goliath triumph, a tale of decency with a moral heart. Whether you buy into the sentiment is a personal choice; but the tiny faults do not matter, as this dramatically shot period piece captures some of the essence of human hardship. Even at 144 minutes, it flies by relatively quickly. The strength of the film lies in the screen charisma not between Zellweger and Crowe as one might expect, but with Crowe and Giamatti, and I draw particular heed to the tear jerking scene in the promoters club that actually made me well up. The two bring their characters alive when they are verbally sparring and I would imagine the most likely nod at the Oscars will be to Giamatti in supporting actor category. Zelleweger puts in another fine performance as the doting but realistic wife who must understand that it isn’t just her family’s hopes that rest with her husband. You mustn't forget the fight choreography within the ring; Crowe’s natural affinity with fighting and acting is perfectly abused. The real sport anoraks should note that Howard has obviously done his research in the fighting styles and training methods of the time. Just another example of this slickly made, truly enlivening production.